It is nothing new to receive regular updates about the upcoming, high-end flagship devices forthe Korean handset maker Samsung. Samsung offers its buyers with a wide range of exciting Smartphones at different pricing levels. Recently, Samsung released the Galaxy S Duos 2 that has performed decently good in different benchmark tests. The Samsung Galaxy S Duos 2 packs in a stunning 4-inch touchscreen display that features a 800 x 480 screen resolution and a pixel density of 233 ppi. The Galaxy S Duos 2 is powered by an advanced dual core processor that clocks at 1.2 GHz. The Galaxy S Duos 2 packs in 768 MB RAM cache. This handset from Samsung runs on Android 4.2.2 Jelly Bean OS. For all those who are not aware, the Samsung Galaxy S Duos 2 is a successor to the much popular and the original S Duos device. Samsung officially launched the S Duos 2 in India at a price tag of Rs. 10,990. Needless to say, the Galaxy S Duos 2 is a mid-range Smartphone from the Samsung stable. It cleverly builds on the success and the popularity of the original device. The Galaxy S Duos was immensely popular owing to its highly competitive price tag and the value for money it offered. It gets even better with the launch of the S Duos 2, but falls slightly below the expectation. The Samsung Galaxy S Duos 2 sports a design that is almost identical to the predecessor. It has a big home button on the front screen while the ear piece sports a grilled look. The 4-inch display packs in 800 x 480 screen resolution, as that of any other Samsung phone. However, if there is anything that is not common between the Galaxy S Duos 2 and its predecessor or any other Samsung device, then it has to be the back panel of the Galaxy S Duos 2. The device’s back side of matte and smooth plastic. The back of the Galaxy S Duos 2 looks premium and offers an excellent fit owing to the faintly curved edges and is easy to hold and use. The sides of the phone are made of faux-metal plastic. However, the sides do not feature an extremely glossy look which ensures that the device looks less cheap. It comes as a pleasant surprise that Samsung has pulled off in the mid to low end segment. There are some other things that are dissimilar to the original. 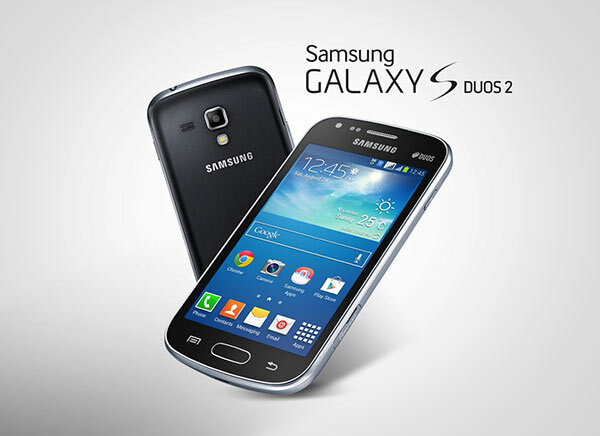 The new Galaxy S Duos 2 comes with a faster and an advanced 1.2 GHz dual core processor. The earlier one only had an option to use a 32 GB memory card. However, this one can also accommodate a 64 GB memory card. The build quality of the Galaxy S Duos 2 is also different from the original version. The Samsung Galaxy S Duos 2 runs on Android 4.2.2. Jelly Bean operating system, which is decent by present day standards.The 4.2.2 Android Jelly Bean operating system is customized by the TouchWiz user interface, a Samsung brainchild. The Galaxy S Duos 2 (GSM + GSM) packs in a 5 megapixel primary shooter, equipped with LED flash. At the front, it has a VGA camera which seems alright for video calling. The Samsung Galaxy S Duos ‘s camera is pretty reasonable. The photos captured are quite good but the phone’s camcorder is not all that great albeit the quality is satisfactory. Indeed, there are quite a few options that have been done away with since the software quality and the camera sensor is a bit less. Overall, the pictures shot are good enough. Since the Galaxy S Duos 2 from Samsung has a 4-inch LCD screen, there is no AMOLED screen with this device. Additionally, this dual SIM mid-range smartphone has the typical sensors. The 5 megapixel camera features autofocus for excellent pictures. It is also expected that the Galaxy S Duos 2 will be updated in a few months. The Galaxy S Duos 2 has an interface which is reminiscent of the Galaxy S III. Both these Samsung phones are using the same User Interface called as TouchWiz Nature UX. However, this dual SIM handset from Samsung makes use of no special effects, for example, the water effect that is seen on the unlock screen of some Samsung phones, like the Galaxy S III. Also, the home screen, menu and the interface are much similar. The Galaxy S Duos 2 smoothly scrolls across the menu. Only a faint lag is felt which is expected to be corrected by the soon to be released software updates. However, the interface, the menu and home screen look much alike. As its name implies, the Galaxy S Duos 2 will be supporting 2 SIM cards. Samsung has done a commendable job with optimizing this dual SIM option. Thus, the user can choose whether he/she wants to activate 1 or 2 SIM cards. There is also an option where the user can use 1 SIM for internet data while the other one can be used to make phone calls or send text messages. It also supports Bluetooth, WI-Fi 802.11 b/g/n and also features a 1500 mAh battery. The Samsung Galaxy S Duos 2 claims to offer a talk time of 8 hours, or a standby time of 280 hours. The Galaxy S Duos 2 measures 121.5mm x 63.1mm x 10.57mm and does not weigh more than 118 grams. There are no two thoughts about the fact that the Samsung Galaxy S Duos 2 is a well-built, rock-solid Smartphone that features the exciting and innovative dual SIM technology. When buyers look to buy a dual SIM Smartphone, it is evident that the market is certainly not a big one and there are no alternatives that can be defined as high-performance ones. Needless to say, the Galaxy S Duos 2 is easily the leading device in the dual SIM Smartphone segment and with its pre-installed hardware, it easily kills its competition, which is not all that fierce presently. A Dimension Too Far? Is 3D the Future or an Unnecessary Gimmick?